Seungwon Youn, Managing Director, Young Woo Lee, General Manager, Firoze Mohammad, Head of Consumer Electronics and Mohammad Rashedul Islam, TV Manager, Samsung Electronics Bangladesh, seen at a ceremony on unveiling the new Samsung TV line up 2016 at a press conference in Dhaka on Thursday. Samsung Electronics, the global leader in TV for 10 consecutive years, has launched its new 2016 lineup of TV at a press conference on Thursday. The new lineup of TV features is in three separate categories: SUHD, Smart TV and Music TV, said a press release. The new line up of TV is launched in the presence of journalists, top officials of distributors, dealers and other stakeholders at the press conference. Seungwon Youn, Managing Director, Young Woo Lee, General Manager, Firoze Mohammad, Head of Consumer Electronics and Mohammad Rashedul Islam, TV Manager, Samsung Electronics Bangladesh unveiled the new TV line up 2016 in the event. “Samsung aims to revolutionise the concept of home entertainment with beautifully designed TVs to meet the changing needs of our consumers, depending on their lifestyle. We are introducing the best picture quality ever with Quantum Dot technology in our new SUHD range. 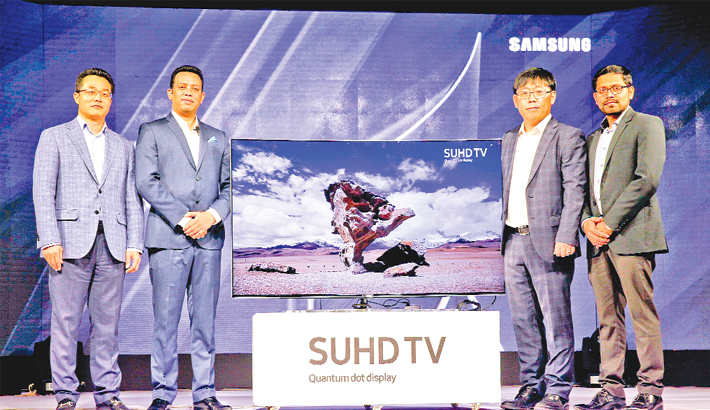 With the introduction of these new ranges of TV, Samsung is bringing global innovations which will greatly enhance the TV viewing experience of the Bangladeshi consumers,” Seungwon Youn, Managing Director, Samsung Electronics Bangladesh, said. The new SUHD TVs with Quantum Dot Display offers Quantum Dot Color and HDR 1000, which demonstrates ground-breaking advances in color reproduction, brightness, contrast and details. The state-of-the-art design with the world’s first bezel-less curved TV and a new, easy and integrated Smart TV experience delivers an unrivalled entertainment experience. The new range of smart televisions will come with a host of innovative features, catering to the unique needs of Bangladeshi consumers. The smart TV range with smart interface, smart content, smart convergence and smart play provides the most advanced smart TV experience. Also, the new range of Music TVs with iconic designand integrated sound station with built-in tweeters will ensure clear and crisp sound which will elevate TV viewing experience to an entire new level. Samsung’s new TV line up will be foundacross all the Samsung Brand Stores and Samsung’sauthorized distributor stores. They are Transcom Digital, Electra International, Rangs, Singer and Fair Electronics Limited. To know more, customers can call at Toll Free 08000-300300 or visit the nearest authorized stores.